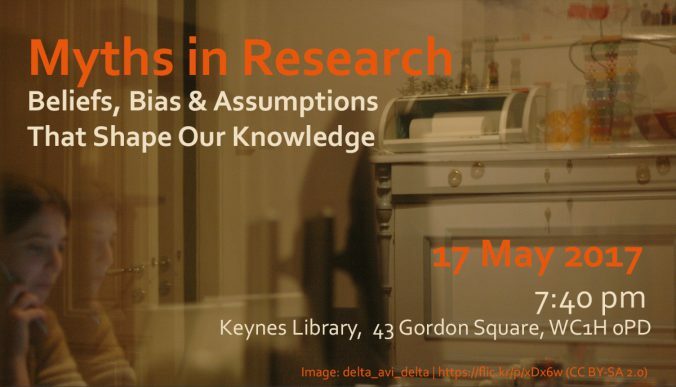 ‘Myths in Research’ invites research students, as well as the wider public to contemplate the role of beliefs, bias and assumptions in academic and everyday processes of knowledge production. The event is to ask where and how research is susceptible to bias, assumptions and beliefs, where this is problematic, inevitable or, in fact, productive. In giving insight into the ways in which different disciplines deal with such types of preconceptions in their research, the aim is to encourage understanding of the research processes in the humanities, arts and social sciences in general, and help research students to critically reflect on their own research experience and practice. Ignacio García Sánchez, MA in Ethnographic & Documentary Filmmaking at University College London, including a screening of his short film, Pili & Me (2016). This event will conclude with networking and drinks. ‘Myths in Research’ is a free event, but booking is required. Click here to secure your place. This event is organised by Mara Arts, Cathrin Bengesser, Giulia Bindi and Elena Shampanova, winners of the 2016-17 BIRMAC Student Competition, and is sponsored by BIRMAC and FMACS.